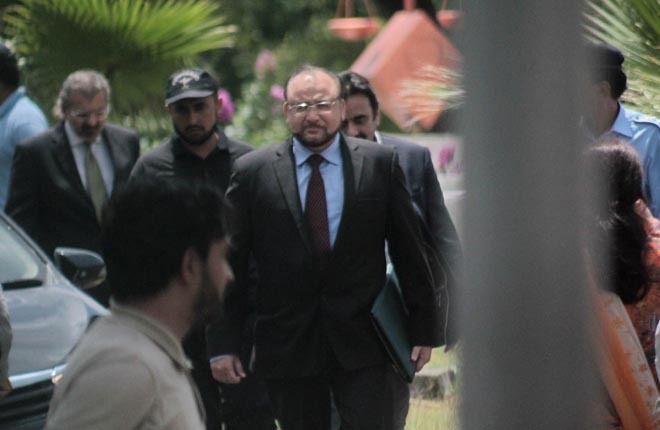 ISLAMABAD: Joint Investigation Team (JIT) head Wajid Zia on Thursday told the court that there was a clear difference in Hussain Nawaz’s stance before the Supreme Court (SC) and his statement to the JIT in the Flagship Investment reference. According to the details, Khawaja Haris continued cross-examining the JIT head on the ninth consecutive day as Accountability Court Judge Arshad Malik conducted hearing of the reference filed by National Accountability Bureau (NAB) against former prime minister Nawaz Sharif and his sons. During the course of proceedings, Zia said that Hussain’s statements before the apex court and the JIT regarding the source of money for Flagship Investment were contradictory. Zia informed the court that the JIT did not find any documents, witness’ statements or evidence that showed former premier Nawaz had provided money for Flagship Investment. He said the JIT also did not find any documents signed by former prime minister Nawaz Sharif as the competent authority of Capital FZE Company. Khawaja Haris objected over the answers of the JIT head and said that court’s time was being “wasted” with such statements of the JIT head. Later, the court adjourned the hearing of the Flagship Investment reference till Friday (today), wherein Haris will continue his cross-examining.